SUPERBE JEEP CHEROKEE 2014 NORTH LATITUDE FWD BAS KILOMÉTRAGE TRÈS BIEN ÉQUIPÉ! AUTOMATIQUE 9 VITESSE,CLIMATISEUR,GROUPE ÉLECTRIQUE,LUMIÈRE AUTOMATIQUE,MIRROIRS CHAUFFANTS ÉLECTRIQUES,SIÈGES CHAUFFANTS,VOLANT CHAUFFANT,ÉCRANS DE 8.4 POUCES,BLUETOOTH,USB,SIRIUS,AUX,DÉMARREUR A DISTANCE ,BARRE DE TOIT,VITRES TEINTÉS,JANTES ALUMINIUMS,PHARES ANTIBROUILLARDS TRÈS BIEN ÉQUIPÉ! 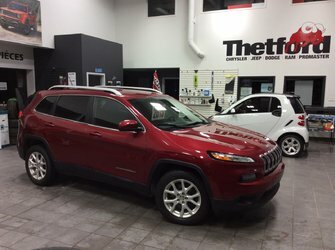 1 PROPRIÉTAIRE,JAMAIS ACCIDENTÉ,MILLAGE CERTIFIÉ,RAPPORT CARFAX,INSPECTÉ PAR TECHNICIEN JEEP+BALANCE DE GARANTIE JEEP COMPLÉTE 2019-10-14OU 60 000KM+ GROUPE PROPULSEUR 2021-10-14 OU 100 000 KM +ASSITANCE ROUTIÈRE LE TOUT SANS FRAIS+GARANTIE PROLONGÉE DISPONIBLE WOW! Ce véhicule, Jeep Cherokee NORTH/**68$SEM.TOUT INCLUS 0$COMTANT 2015 1 PROPRIÉTAIREBAS KILOMÉTRAGE//MILLAGE CERTIFIÉ/INSPECTÉ/GARANTIE vous intéresse?